I'll be doing several other sizes but for now is a pair of 17mm options, one DD one linear regulated. 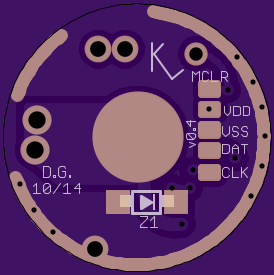 I've switched over to the smaller 6-pin 10F322, this MCU allows all the functions of "The Ultimate Flashlight Code" for momentary use (with the code written in C, not assembly) AND another very simple to use (but very versatile) clicky switch UI (also written in C) that is equally as suited for a tiny pocket EDC as it is a huge mega output light. Oh also, the 10F322's cost just $.50 each! I'm gonna be making new video demo's of both UI's soon (not today) so I'll post that up later. 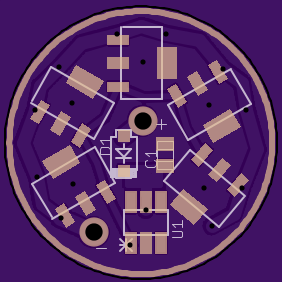 Zener pad on bottom is left unpopulated for single cell builds. Allows for programming while still installed in light! I'll be making up a 15, 15.17 and 20mm versions of these in the next few weeks (unless anyone else wants to help). Hint hint, I can provide the .sch to anyone interested. 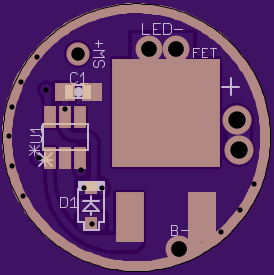 For the 15 and the 15.17 I will be using a SOT-23-3 package "baby FET" which can deliver up to about 5.5A for lower power builds (not that 5.5A is low power, but for single emitter lights and stuff). 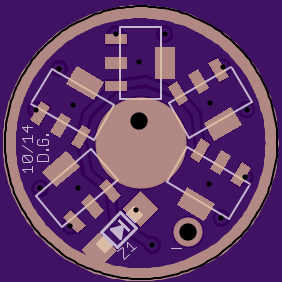 Next driver I post up will be a 10m SINGLE SIDED FET driver! Thanks CK. Unfortunately my abilities do not come close to making these. Thanks Ck, 10x 7135's on the board is a lot better than stacking 2x, I have a few lights that would appreciate these boards. Thanks for sharing this much helpful information here. It will be helpful in my future projects. I want to know more something about it. Can you please tell me its voltage current required specifications? Also its most functional area based on the applications?